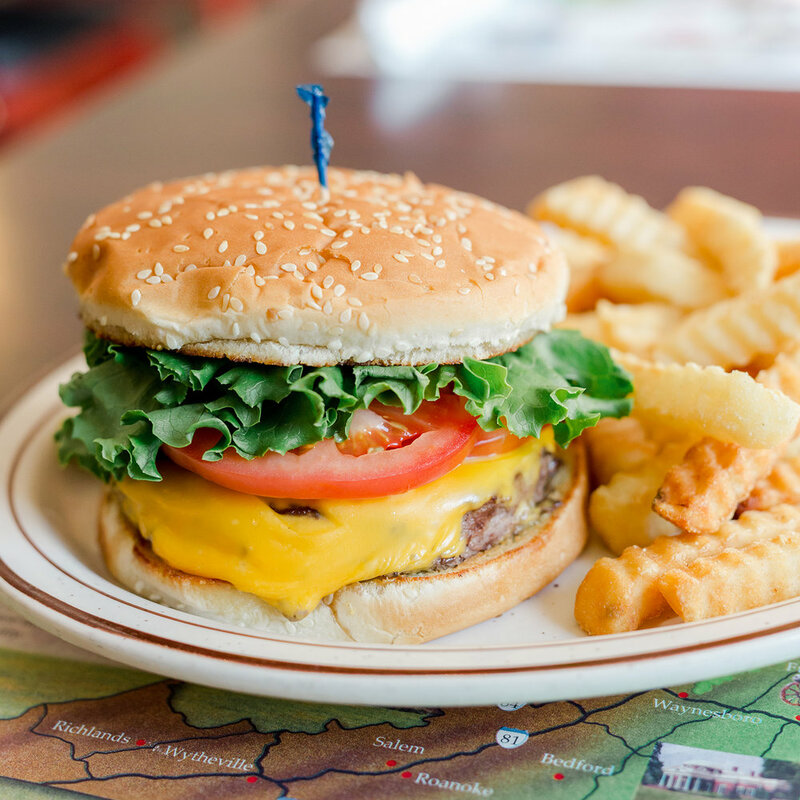 COME VISIT THE VILLA DINER, CHARLOTTESVILLE TRADITION SINCE 2005. "Looking for a place to sit down for a casual lunch and this was close by. Great option for a diner meal. Some of our group had breakfast and others lunch. Everyone satisfied. The waitress was very nice." Our full menu is made to order and many of our menu items are house made such as our pancake and waffle batters, biscuits, soups, sides and salad dressings. We roast our own turkey breast and roast beef in house and slice all of our own meats and cheeses in order to offer, fresher, better sandwiches and specials. Big pancakes made from scratch with fresh Grade A eggs, flour, and buttermilk. Three buttermilk pancakes and two eggs any style. Our buttermilk pancakes filled with lots of plump blueberries. Our buttermilk Pancakes topped with sweet, glazed strawberries. With powdered sugar and whipped cream on request. Fresh strawberries may be substituted. Three buttermilk pancakes topped with warm, spice cinnamon apples. Our pancakes with chocolate chips mixed into the batter, and topped with more chocolate chips and topped with more chocolate chips. Pancakes grilled with cinnamon toasted pecans and topped with more pecans and cinnamon sugar. Three light, sweet, paper-thin pancakes, grilled golden brown and topped with cinnamon sugar. Three of our crepes and two eggs any style. Filled with warm Nutella and topped with chocolate sauce, chocolate chips, powdered sugar, and whipped cream. Our delicious crepes topped with sweet, glazed strawberries, powdered sugar and whipped cream. Fresh strawberries may be substituted. Filled and topped with warm, spiced, cinnamon apples. Filled with warm blueberry compote and topped with whipped cream. Topped with vanilla ice cream, cinnamon sugar and whipped cream. Topped with warm, spiced, cinnamon apples and whipped cream. With cinnamon toasted pecans and topped with more pecans and cinnamon sugar. Topped with vanilla ice cream and whipped cream. Two eggs any style, with your choice of bacon, sausage, ham or corned beef hash; choice of hash browns or grits; toast, biscuits, or English muffin; coffee and a small juice. No substitutions. Our hand cut 8 ounce New York strip steak with two eggs any style, hash browns or grits, and toast, biscuits or English muffin. Three buttermilk pancakes or 3 slices of French Toast, with two eggs any style and your choice of bacon, sausage, ham or corned beef hash. Fluffy house made biscuits topped with our hot sausage gravy. Three slices of thick cut Texas toast, dipped in our sweet cream and egg batter, grilled and topped with cinnamon sugar. 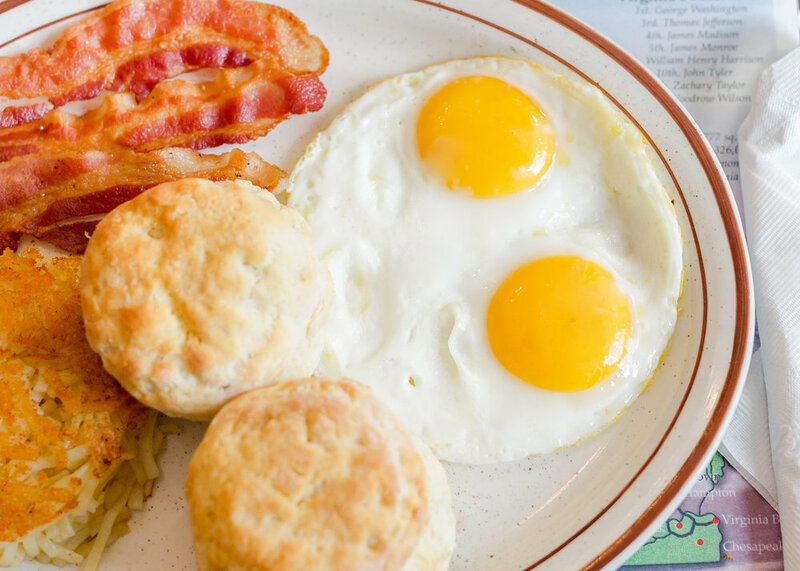 Two egg cooked your way with a generous slice of (bold) country ham with choice of hash browns or grits, and toast, English muffin or biscuits. 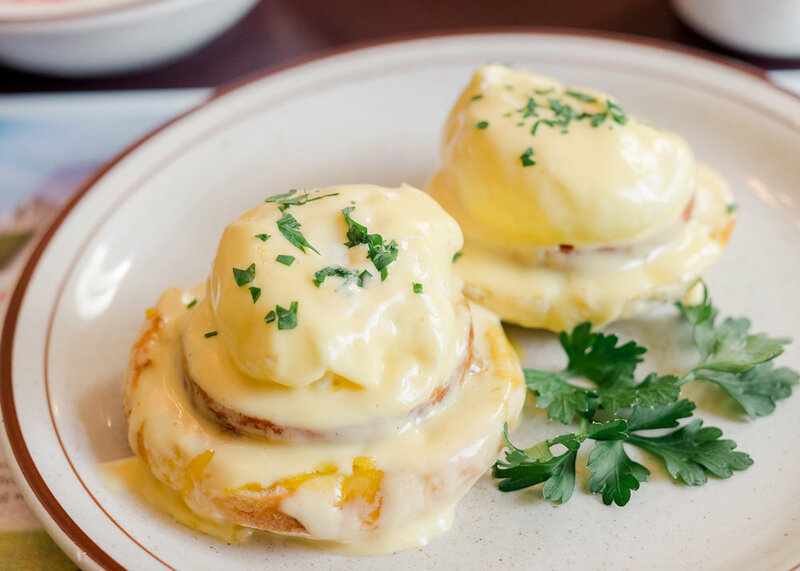 Two poached eggs served on a toasted English muffin and Canadian bacon and topped with warm Hollandaise sauce. Served with a cup of fresh fruit. All omelets are made with three large, Grade A eggs and served with your choice of toast, biscuits or English muffin. Two eggs any style with toast, biscuits, or English Eggbeaters may be substituted for and additional 50¢ And hash browns for 1.50. Diced pit smoked ham with your choice of American, sausage, ham, or corned beef hash, with toast, cheddar, SWiSS, provolone, or pepper-jack. Spinach, mushrooms, tomatoes, onions and peppers with hash browns or grits your choice of cheese. Eggs with cheese add 75¢. Two eggs any style with toast, biscuits, or English muffin. 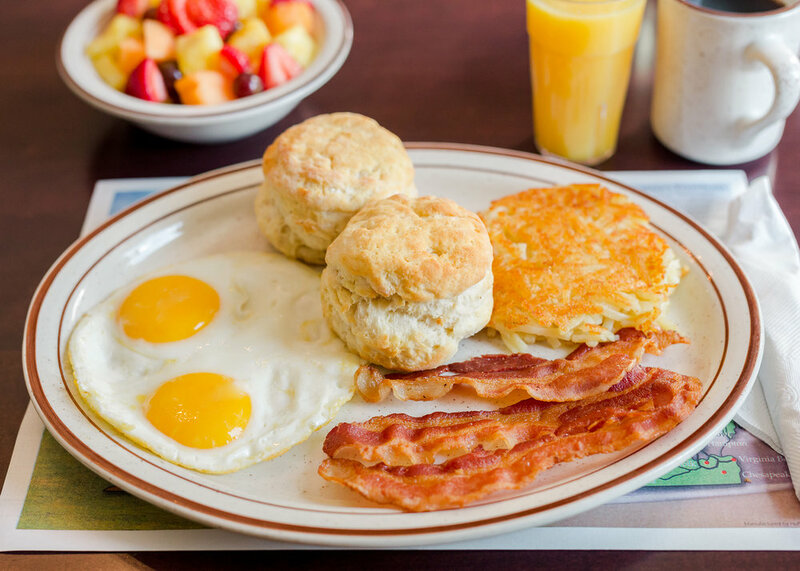 Two eggs any style, with your choice of bacon, sausage, ham, or corned beef hash, with toast, biscuits, or English muffin. 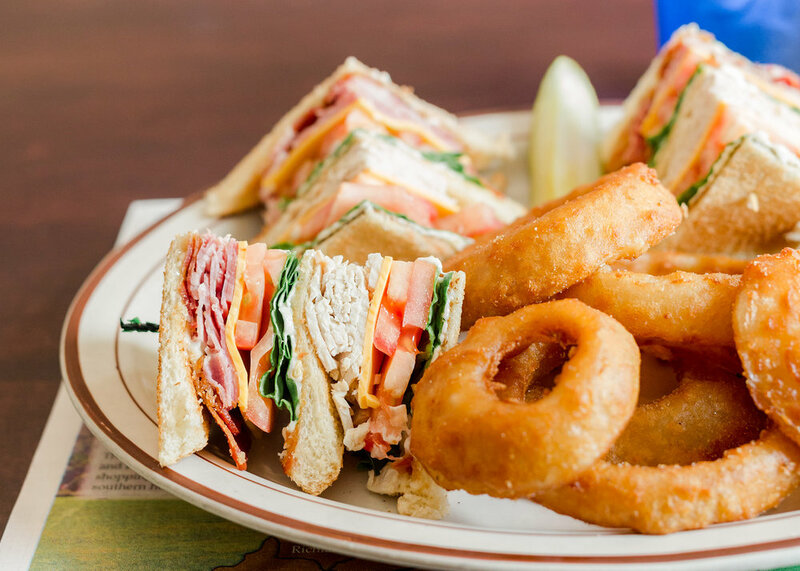 All Sandwiches are served with your choice of french fries, onion rings, potato salad, cole slaw or fresh fruit. A true classic. Shaved, lean corned beef, served hot with sauerkraut, 1000 Island dressing, and swiss cheese, piled high on grilled rye. Also available as a Turkey Reuben. Oven roasted turkey breast and Virginia ham, with bacon, American cheese, lettuce, tomato, and mayonnaise, served triple decker style on toasted white or wheat. A Villa favorite for over 20 years! Seasoned ground lamb and beef, spit roasted and sliced thin. 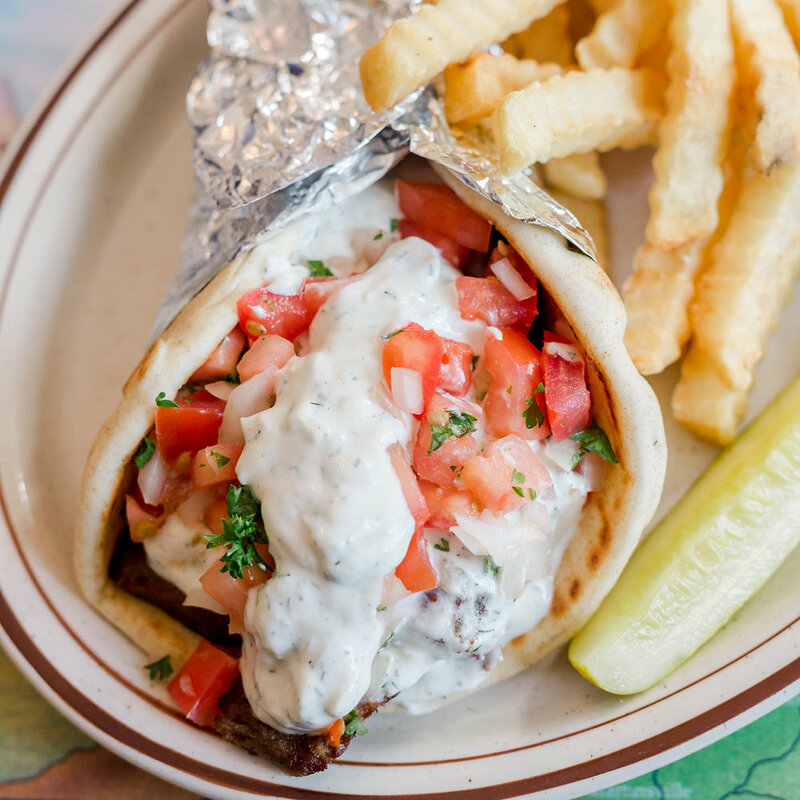 Served in a grilled pita wrap with fresh tomato and onions and our house-made tzatziki sauce. Our hand breaded chicken tenders with cheddar cheese, crispy bacon, lettuce, tomato, and our homemade Ranch dressing in a warm flour tortilla. Bursting with six pieces of hickory smoked bacon, crisp green leaf lettuce, fresh sliced tomatoes, and mayonnaise on white or wheat toast. Smoked with hickory and slow roasted in house, our BBQ is dressed in a South Carolina style mustard based sauce. Topped with sweet and tangy cole slaw on a toasted potato bun. Our delicious homemade chicken salad, served on flaky croissant with bacon, lettuce, tomato, and mayonnaise. Fresh roast beef, grilled and chopped with sweet grilled onions. Topped with melted provolone cheese and served with lettuce, tomato, and mayonnaise on a toasted sub roll. Smoked ham, Genoa salami, and pepperoni served hot with provolone cheese, lettuce, tomato, onions, banana peppers, mayo, and Italian vinaigrette. Fresh, hand formed 6 ounce burger, cooked to order, and served with lettuce, tomato, and mayo on a grilled sesame seed bun. Our fresh pork burger, ground and seasoned in house, chargrilled and topped with a zesty maple and apple cider glaze with carmelized onions and cheddar cheese on a toasted Kaiser roll. Ground turkey burger topped with grilled mushrooms and swiss cheese, served on a Kaiser roll with lettuce, tomato, and herb mayonnaise. Made from scratch, our creamy, seasoned broth is chock full of roast chicken pieces, fresh vegetables, and tri-color rotini noodles. Check with your server about today’s delicious soup. Four plump chicken tenders, hand-breaded in house and fried golden brown. Served with your choice, of Ranch,BBQ sauce, honey mustard, or honey. Grilled flour tortillas filled with cheddar cheese, bacon, grilled onions, fresh diced tomatoes, and jalapenos. Served with sour cream and salsa. Grilled golden brown with your choice of American, cheddar, swiss, provolone, or pepper jack cheese on white, wheat or rye. Our house roasted turkey breast topped with crisp bacon, sharp cheddar cheese, lettuce, tomato, and herb mayonnaise on grilled Italian bread. Our homemade tuna salad topped with grilled tomato and swiss cheese and served hot on butter grilled rye. Our fresh, hand formed burger patty cooked to order, and topped with melted swiss and sauteéd onions on grilled rye. Our fresh salad mix topped with cucumbers, grape tomatoes, carrots, red cabbage with hard boiled egg, diced cheddar cheese, Virginia ham, and roasted turkey breast. Served with our Italian Vinaigrette. Tender fresh spinach leaves, topped with fresh strawberries, sliced button mushrooms, red onion, feta cheese, and spiced pecans finished with our housemade balsamic vinaigrette. 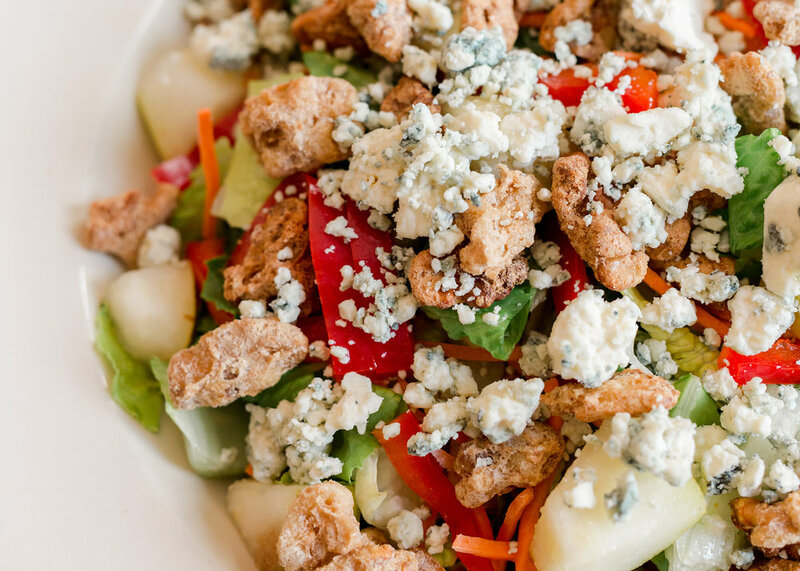 A fresh lettuce blend tossed with juicy pears, candied walnuts, carrots, red peppers, crumbled Gorgonzola cheese, and served with our homemade champagne vinaigrette. A bed of crisp salad greens topped with cucumbers, tomatoes, carrots, red cabbage, hard boiled egg, crispy bacon, cheddar cheese, and topped with a grilled chicken breast. With honey mustard dressing. A crisp blend of salad greens, fresh grape tomatoes, honey toasted almonds, sweet red peppers, crispy Chinese noodles, topped with crispy leeks. Served with our homemade Sesame vinaigrette. We want to hear from you! Contact us here and let us know what you think.